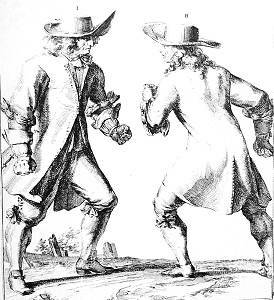 H and J both have assumed postures to punch each other with the fists, inside the arms, and standing thus, (though this is not shown on the plate) one could give the other a leg-strike [the meaning here might be a sweep as well as a kick] so that the one receiving that strike would have to fall. 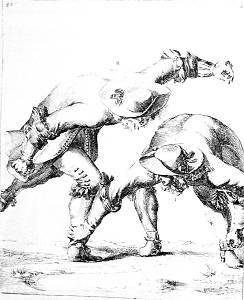 H punches J, but J seeing this bends down, so that H punches himself off balance, and at this point J grasps the right foot of H, to throw him. 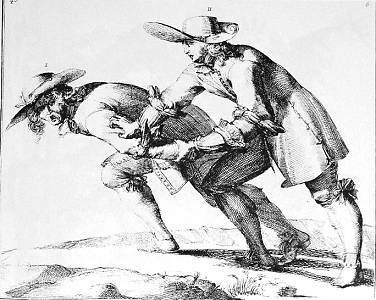 H feeling himself fall, pushes J with his right knee against the thigh, so J is also forced to fall. In this fall H also tries to grip the left leg of J, but is unsuccessful. 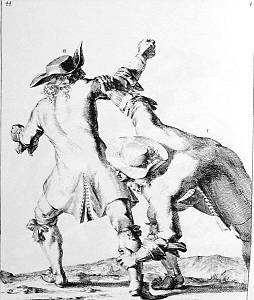 H and J having both stood up again, now as if to punch outside the arms, so H first punches J, who at once grasps the striking arm behind the shoulder with his right hand, and with the left hand J grasps the right leg of H, forcing him to fall. 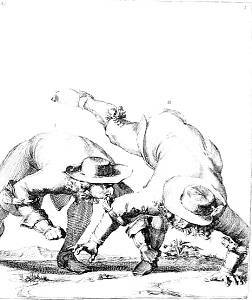 This throw by J can be performed in another way, as seen in the next plate. J throws H, holding the arm he grasped, and pulling or pushing him around a little, grasps his left shoulder with the left hand, places his left knee on his back, and so bends him backwards, forcing him to fall. 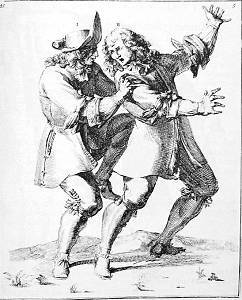 To avoid this throw, as J has placed his knee on the back of H (as shown on the previous plate), so H must, by twisting his shoulders, free himself so he can grasp one or the other hand of J, whichever has released its grip, and holding this (on the plate it is the left hand), turns it behind the back of J, and placing his other hand on the twisted arm, H can throw J, or at least force him to fall.